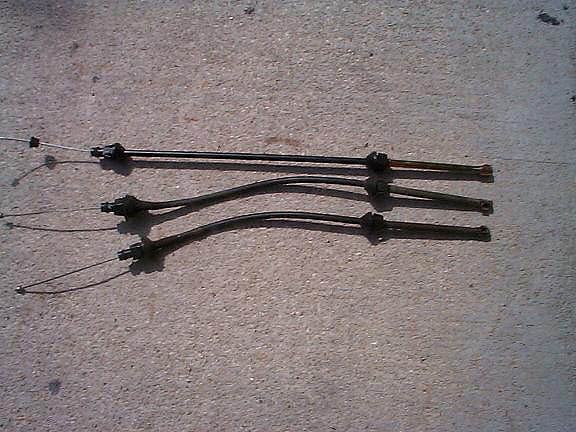 Here are three throttle cables available on Buick Skylark and GS models. The first cable for 70-2 GS455 models, top one, is a new reproduction by McIntyre Enterprises. It measures approx. 21" overall and 11" between mounting tabs/points. The next cable, second from the top, is from a 350-2bbl Skylark, it measures approx. 19.5" overall and 9.25" between mounting tabs. The last cable is from a 350-4bbl Skylark. It measures approx. 20.25" overall and 10" between mounting tabs. If you are converting your 350-2bbl to a 4bbl set-up, sometimes the 2bbl throttle cable will work. If not, you will need to get the correct length cable. The 350 cables are not being reproduced.